Two bedroom family and pet friendly condo across from lifts! This pet-friendly two bedroom condo is perfect for a larger family or group of up to 7 people. A large living room and wood fireplace provide the perfect, cozy venue to sit together and tell epic ski stories of your day on the hill. One bedroom sleeps two in a comfortable king sized bed, and the second is equipped with one queen and twin over twin bunks. Also available is an old-fashion roll-away bed. A covered deck provides year-round outdoor space and a chance to breathe the crisp, fresh air without leaving the comfort of your condo. Base Camp was the first building complex to offer accommodations at the base of the mountain in 1972 and remains one of the most convenient settings to call home. Wood burning stoves and generously sized decks and porches combine homey mountain comfort with a sense of being in nature. You won’t find elevators and heated sidewalks here, but you will find relaxation, quality family time, and a great bang for your buck. 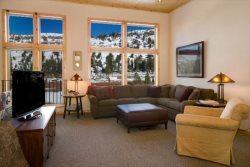 Base camp takes you back to the basics of ski resort lodging--just footsteps from 5 ski lifts, 2 restaurants, shuttle stops, shopping, and the cross country trails, this complex is one of the most conveniently located within the Kirkwood valley. Many families choose these residences for their laid-back ambiance and family friendly snow play areas. Larger Base Camp condos have covered parking. A coin operated washer and dryer are also available. 2 Bathrooms - We provide towels, soap, shampoo, conditioner and hairdryer. Full Kitchen with the following amenities: dining table seating for 6, dishwasher, electric stove, microwave, coffee maker, basic pots and pans, dishes and silverware. TV with Cable and VCR. No Washer and Dryer provided - Coin operated machines available. No access to Recreation Center. No elevator - Stair access only. This property is pet friendly. Wonderful!!! The road were closed due to the storm and thus we were snowed in and had to extend our stay by a day. Kim was helpful in facilitating that, allowed us to switch our late check out and even called us with road information as we awaited word of roads opening. Amazing service!! Wonderful place to be snowed in! Perfect location, covered parking and pet friendly allowed us to vacation without having to worry about a thing. It was perfect for the 3 of us and our dog. The floor plan is great and very conducive to a larger group. The unit is a little dated and worn but we want to stay in this unit again. Especially liked that they allowed pets as we brought our small dog. The location is awesome--close to the lifts, cross country skiing trails, and village center. Just more forks in the kitchen. MANAGER RESPONSE: We will provide more forks for this home.